This is certainly the time of year for apples and candy. I like to tell Enzo that this is a candy apple even though it's just peanut butter. wash out your apples really well so you get the wax off the apple. If you pick the apples from a tree it's easier to wash.
Dry them off completely before spreading the peanut butter on them. Place a stick (I had the neighborhood kids pick their own sticks. Make sure it's from a non toxic tree) in the apple. Make sure the stick goes all the way down. This will make it easier for you to put peanut butter on it and easier for the kids to hold. Spread peanut butter around the apple. I like to use a spoon for this, somehow it makes it easier. Mix the granola and sprinkles together on a plate. Roll the apple around the the granola mixture. It will stick easily to the apple because of the peanut butter. This is an easy recipe to make with kids. 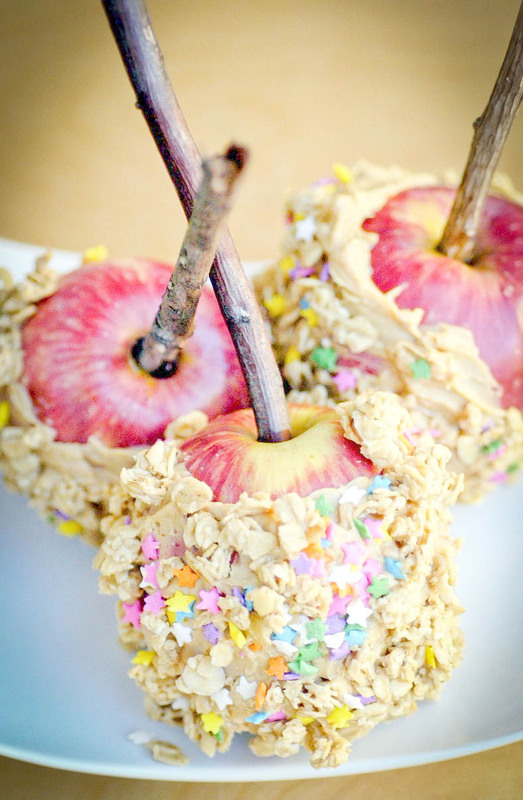 and rolling their apples on granola and sprinkles. oh, and that cute kid is unfortunately not my son. It's a cute neighbor who likes my cooking. Damaris, this looks simply awesome! I am sure it's going to be a hit with my son and his friends too! Oh what a cutie, lovely apples. Those are beautiful! You take amazing shots! Beautiful website! Thanks for commenting on my blog! Yours is lovely. I hope that I can make mine prettier and more accessible at some point. These apples look delicious! Really beautiful too. I love the stick idea! Denise would love this since she is always picking up random pieces of stick from the ground! These are ingenious! My grandson loves caramel apples, but all that sugar makes him a little crazy. I'm sending a link to my daughter. She's going to love your ideas! Looks like a fun activity to do with kids. this is brilliant! dentists everywhere would be happier knowing this idea exists. 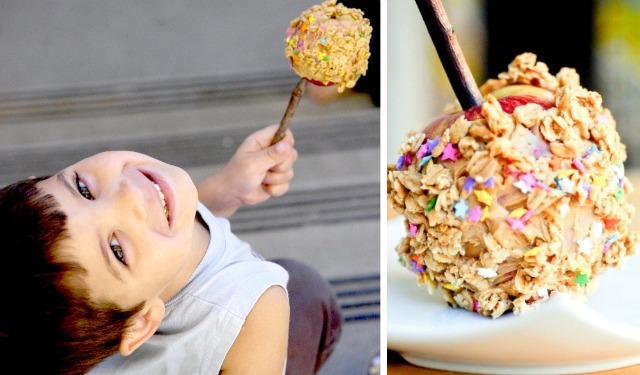 What a great idea and a little healthier then the candy apple cousin!